So yesterday I discussed my love of Halloween related treats. Today I want to discuss something else close to my heart: Conventions. I've been attending conventions and shows since 1994. That year I got to play tag-along with my friend Ryan who was attending the local "Small Press Xpo" in Bethesda, MD. The convention focused on independent comics done by underground artists. I had never been exposed to indie comics before; I was a slave to the Marvel, DC, and Image machines at the time. I picked up a few comics by local artists. I lost them later but the impact of attending a show like this stayed with me to this day. Over the following years, I would attend every and any kind of convention in the book. Perhaps the biggest convention to happen to me at the time was my first out of town trip with Ryan yet again. Ironically, it was to Rochester, NY for Botcon, a convention dedicated to Transformers. Ryan had gotten me into Transformers in the past few years and I jumped at the chance to take a trip to an overnight convention and a new city I've never been. This convention is still running today and I had a great time. My first overnight trip was a huge success and I walked away with a lot of memories. I actually would return to Botcon 2001, a little wiser and more mature than my first trip. The convention was located downtown at the Riverside Convention Center right on the water. And I can tell you that 15 years later, everytime I pass the convention center, the memories overwhelm me. In 1998, I'd attend an anime convention, dedicated to Japanese animation. Once again, with Ryan in tow. I always had an interest in anime, but not enough to really warrant attending anime conventions for the next few years. I learned a lot about the convention circuit and the differences between how anime fans and comic fans or even Transformers view things and even act and interact. I actually kinda enjoyed attending anime conventions for a couple years but with my interest in the medium waning, it was time to stop. Other than running with a group called "The Lou World order" and "feuding" with a Transformers fan group called "WiiGii" and their leader David Willis(note how I emphasized the word feuding. It was nothing more than us thinking we were bigger than we really were. it was pretty stupid and it made us look super dumb. ), traveling to new towns and being banned from a convention alltogether, anime conventions were somewhat of a low point for me. Although learning about how to plan for conventions and the traveling, I look at most of my experiences in the days of anime fandom and cringe. Without a doubt the biggest convention scene to impact my life would be the world of horror movie conventions. After years of stalling, I bit the bullet and attended my first Chiller Theatre, a convention located in(at that time) East Rutherford, NJ. in April 2004. It was pretty exciting. Once again, the first time in a new city is always a big pull for me. The big draw was the cast of the 1966 Batman TV series, a show that holds a lot of emotional value. 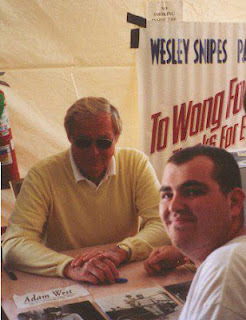 Meeting Adam West, Julie Newmar and Frank Gorshin was huge for me. 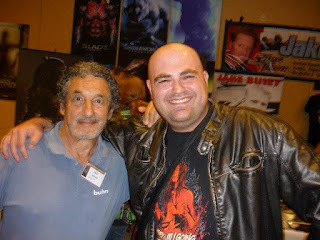 And being a lifelong horror fan, the appeal of a horror convention was monumental. The only other guest I remember getting excited for was one of my all time favorite wrestlers and a guy that reminds me of my late father, Rowdy Roddy Piper. For my first show, Chiller was stacked. I had a great time meeting the guests and the fans. I was instantly hooked. 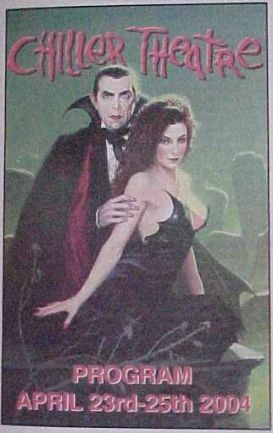 I would attend another Chiller in October 2005 and that convention was even more fun. I have yet to return to Chiller, but in the meantime I'd say I've been doing fine for myself. While I have a tremendous amount of appreciation for Chiller for being my first horror convention, Monster Mania, a show located outside Philadelphia in Cherry Hill, NJ., has been very good to me. I first became aware in 2003 after reading about an exclusive Fred Krueger(pre-burned) figure being sold at the show. Naturally this was the summer of Freddy vs. Jason and Freddy was back in the spotlight. After discovering this figure, I had to get the details and throught he legendary Fangoria Forums, I discovered Monster Mania. 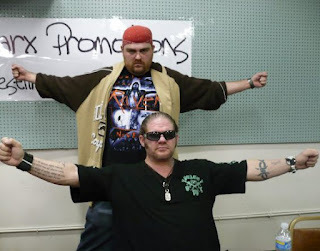 After planning and planning, I finally made my Monster Mania debut in 2008 for Monster Mania 10. Just like my experience at Chiller, I was blown away. And oddly enough, Roddy Piper was a guest at my first Monster Mania. My following Monster Mania experiences would be just as amazing. 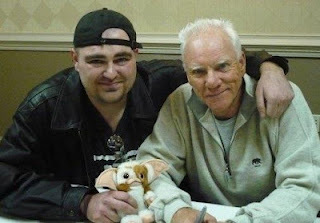 I'd meet some of my all time favorite Hollywood icons including Robert "Freddy Krueger" Englund, Corey Feldman, Heather Langenkamp, Lance Henriksen, Anthony Michael Hall Malcolm McDowell, the cast of the Boondock Saints, Kane Hodder, Linnea Quigley, Gary Busey and so many countless others. Probably my favorite convention was meeting the entire cast of my favorite Elm Street installment, "Nightmare on Elm Street 5: The Dream Child". i even got to dine with a few stars at a local bar and grill down the road. It was great. Had you told me that 'd be having dinner and drinks with Joe "Mark Grey" Seely and Lisa "Alice Johnson" Wilcox, I'd never believe you. Meeting the stars and hearing their stories has always been a true draw for me. In fact, had you told me as a child I'd meet the man behind the lethal glove, Robert Englund, I'd call you crazy. Aside from meeting all these great guests, I've also made many fantastic relationships come from my love of convention going. I quickly learned that Monster Mania is not just a convention, but it's a family. I've made so many great friends over the years. I've met my girlfriend of two years(as of this writing), Laurie at the first MM in Hunt Valley, MD. in 2010. I've also met someone who would become one of my best friends, Chris Behringer through this convention. Through the many shows I've attended, I usually leave with at least one new friend. Out of all the shows I've attended, Monster Mania may be the one I'm most loyal too. And that's not a bad thing. It's a fun show and it's a show I'm very grateful for attending. In between my years of Chiller and Monster Mania I took a small break. My shows scaled down. I attended New York Comic Con with Ryan for his 25th birthday in 2007. But it was in 2006 that I attended my first wrestling convention. I attended a special "NWA Capitol Legends Fanfest", a show that revolved around the glory days of wrestling. 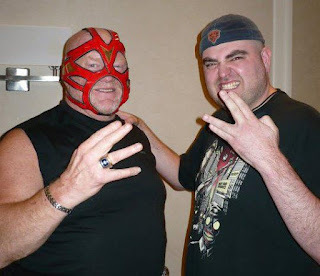 In the DC Metro Area for only one summer(it normally stays in Charlotte, NC every year), it featured stars of the old NWA, WCW, WWF and TNA. It was pretty awesome being a lifelong wrestling fan seeing my favorites just waltz on by me. I got to hear stories and meet friends and fans. I made friends that would stick with me to today, including my friends Carlucci, Crans and JDub. It was a nice entry into the world of wrestling conventions. But my mind would be blown in just a little over a year when I'd attend Signamania. Signamania is a show right outside Philadelphia run by the great staff at George's Cards and Collectibles. A show that welcomes all fans of all ages to come and meet their favorite stars from all eras. My best friend Andrew and I have attended many Signamania's since 2008 and have met so many of our favorite stars that we grew up admiring including Diamond Dallas Page, Mean Gene Okerlund, The Hart Foundation, the Dudley Boys, Val Venis, Kevin Nash and so many more. In fact if you've never heard Mean Gene tell jokes and stories over a a few beers in the bar, you've never lived. Wrestling shows are definitely a favorite of mine. 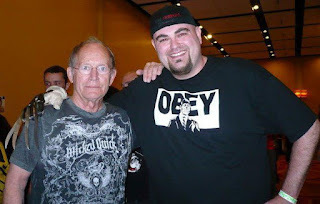 And being a lifelong fan of horror and wrestling seem to have proved why I enjoy their respective conventions the most. Conventions have always been a huge part of my life and I love attending. They've always been a sort of "light at the end of the tunnel" for me. It gives me something to look forward to and for one weekend I can let my freak flag fly. This year I attended a few toy shows, but no huge conventions. I'm ok with that. After 18 years, I need a break! Laurie and I, however, are looking forward to returning to Monster Mania in march 2013. This show will ring in Monster Mania's tenth anniversary and I have no doubt that it will be monster-ously huge! 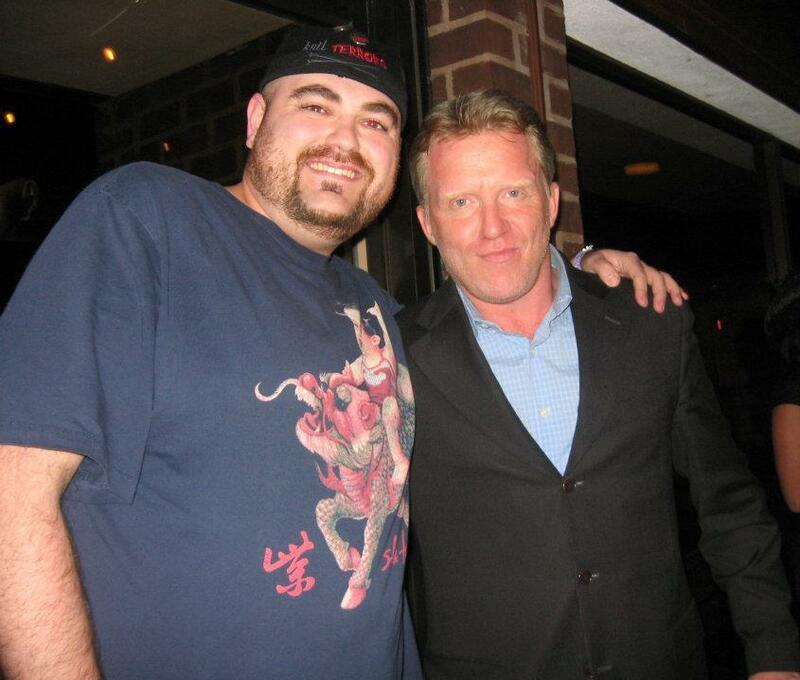 Anthony Michael Hall and I at the bar, reminiscing about Tales From The Crypt. 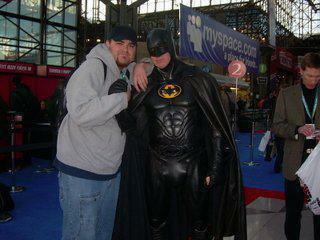 An awesome Batman and I at New York Comic Con 2007! My friend Chris Behringer, a model and Jason! The late great David Hess and I. 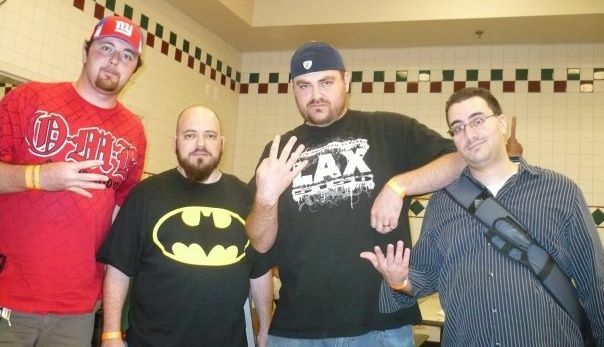 My best friend Andrew, the mighty Brivan, me and Sean Carlucci. Raven and I at the ECW Reunion. 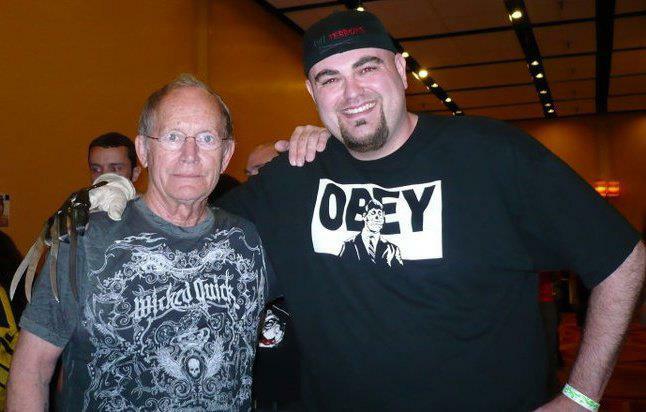 Can you tell how stoked I was to meet the legendary Lance Henriksen. Malcolm McDowell is NOT a fan of my mom. lmao! What more can I say...He is the man! 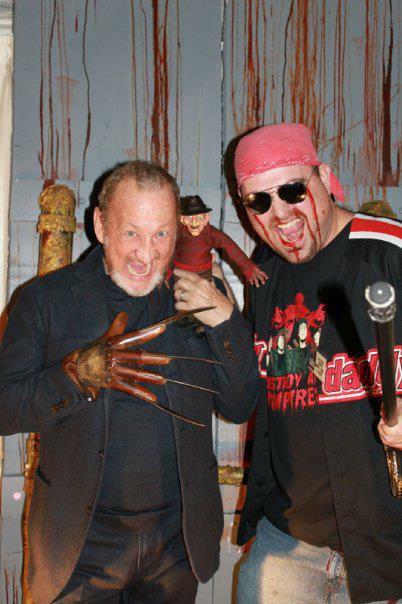 Robert Englund himself! 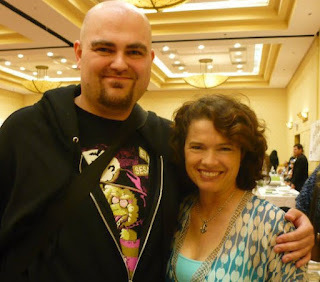 A longtime crush for me, Miss Heather Langenkamp. 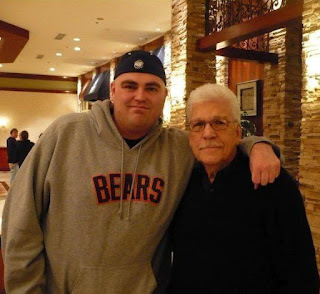 One of the greatest icons of horror, TOM ATKINS. BATMAN. ADAM WEST. What better way to close out this entry? My Love Of Being A Halloween Fatty!